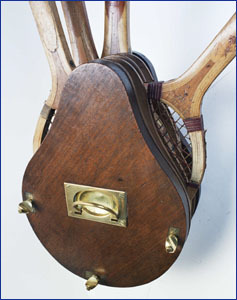 These attractive old presses were most often made of mahogany or other hard woods and were designed to hold 2-6 rackets. They are great for displaying old rackets. We have a limited number of nice vintage presses. Allow us to select one on your behalf. Slight marks are normal with the age of these items.